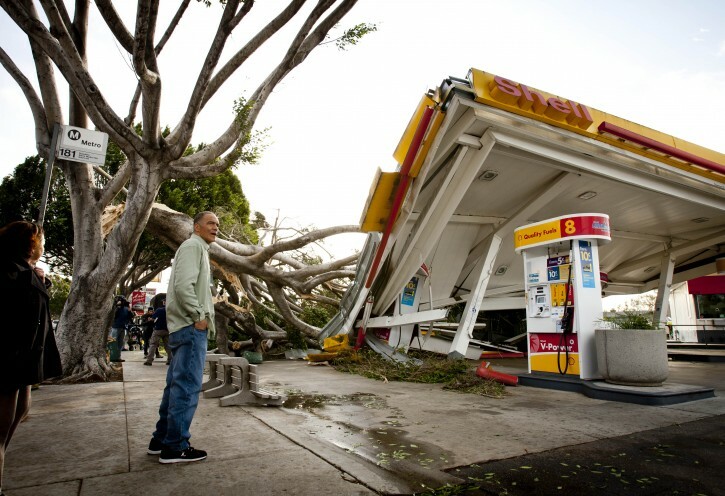 Los Angeles, CA - Some of the worst winds in years blasted the West on Thursday, toppling trees and trucks, kicking up blinding dust across highways and bringing hurricane-force gusts of more than 100 mph in the mountains. “It was like being in a hurricane. I thought I was going to blow away,” said Bill Patzert of NASA’s Jet Propulsion Laboratory, who lives in the Southern California city of Sierra Madre. Patzert, like hundreds of thousands of people across the region, lost power at his home. A heavy tree limb blocked his driveway. He estimated winds peaked between 80 to 90 mph in his neighborhood overnight. “In terms of ferocity, we get something like this every 10 years or so,” he said. The windstorms were the result of a dramatic difference in pressure between a strong, high-pressure system and a cold, low-pressure system, meteorologists said. This funnels strong winds down mountain canyons and slopes. The system was expected to bring similar, but less ferocious conditions as far away as Wyoming and New Mexico. 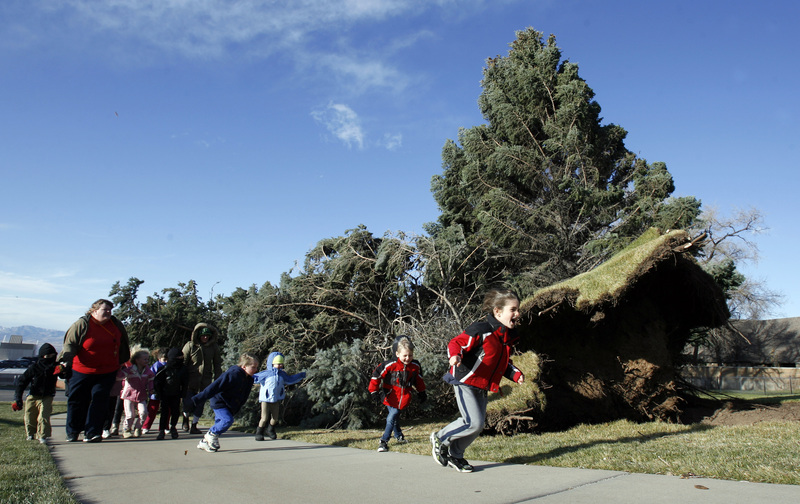 The front will bring blustery weather to Oklahoma, Missouri and Indiana, meteorologists said. California, however, was the hardest hit, with more than 200,000 utility customers without power after the winds swept through Wednesday. About 26,000 were without power in the Santa Cruz Mountains in the northern part of the state. The winds downed trees and power lines and blew semi-trailers off the road. Residents traveling the roads encountered tree branches blocking streets and darkened traffic lights. “It was a terrifying ride for me, coming here in pitch dark ... and watching motorists take no notice of lights being out,” said Bob Spencer, a spokesman for the Los Angeles County Department of Public Works. Pasadena closed schools and libraries and declared a local emergency, the first since 2004. Fire officials said 40 people were evacuated from an apartment building after a tree collapsed, smashing part of the roof. 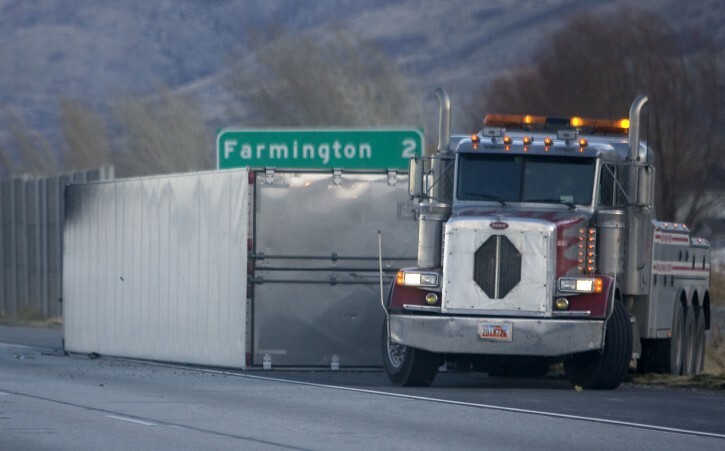 High winds ripped through Utah, overturning several semi-trucks on or near Interstate 15, and 54,000 customers were without power along the state’s 120-mile Wasatch Front as high winds took down power lines. Police asked schools to close in Centerville, where the weather service reported a 102 mph gust. Mail delivery and trash pickup were cancelled. On Wednesday, 23 flights were diverted and several delayed at Los Angeles International Airport because of severe crosswinds and debris on runways, officials said. Power was out for an hour at passenger terminals. The winds had died down by Thursday morning but some delays were reported. Departures to Las Vegas McCarran International Airport were averaging an hour’s delay because of bad weather there. In Nevada, weather officials warned that blowing dust was creating visibility problems on a highway that guides drivers between Reno and Las Vegas. In Steamboat Springs, Colo., the roof of a four-story condominium complex was blown off and about 100 trees were knocked over, some landing on homes. A ski area shut down its lifts for the day after reporting a gust of 123 mph. The winds were colder but fiercer than the Santa Ana winds that often hit California in late fall, but they carried the same ability to dry out brush and push fires into conflagrations. Many of the shuls in the city have flags--- check to see if they are red or green. I think it probably is down when cell towers and trees were knocked over... or at least until you see the flags don't use it.